Founded by Evan Robbins, a Verona resident and a history teacher at a New Jersey public high school, and his students in 2006, BTCTE has matured in its mission to identify, rescue, rehabilitate and reintegrate trafficked children. The organization provides resources for ensuring the rescued children’s long-term safety, health, and access to education. To date, BTCTE has rescued 51 children from servitude and is currently providing care for a total 66 previously victimized children and young adults—including some who have gained freedom through other means. One of these rescued children, Christian [name changed] will be attending and speaking at this year’s dinner. In addition, the dedicated social worker who plays a large part in the rehabilitation and care of the children, will share her experiences in the field. Expected to draw as least 200 guests, the program will be emcee’d by WABC-TV reporter and news anchor Michelle Charlesworth. The evening will include an online silent auction with an exciting array of prizes, a raffle for a pair of house seats to Hamilton on Broadway, live music, and delicious food. To purchase tickets for the event, please visit http://www.btcte.org. When he’s not dreaming big for the future, Christian is industrious in his present environment. With limited opportunities for work in his small village near the border of Togo, he has found a creative way to earn extra money and help his family. During school breaks and summer vacations for the past few years, he has made brooms out of straw and wood and taken them to Togo to sell. Currently, Christian is excelling in his second year of secondary (high) school. 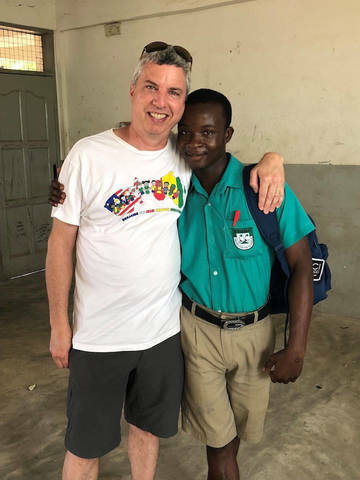 His school is overcrowded and students attend on a rotating basis, so his visit to America will not interrupt his schooling. We are thrilled to have Christian speak at our dinner on November 15th. We hope you can join us to meet this extraordinary young man and hear his compelling story.